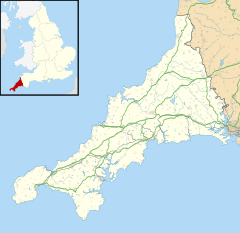 St Tudy (Cornish: Eglostudi) is a civil parish and village in north Cornwall, England, United Kingdom. The village is situated in the River Camel valley approximately five miles northeast of Wadebridge. The village is mentioned as having a cattle fair in Owen's book of fairs 1788. There was formerly a manor house at Tinten and the chapel may still be recognized. It has been reused as a barn and has a 15th-century window. Other small former manor houses in the parish are Hengar, which was destroyed by a fire in 1904 (in 1906 it was rebuilt in Elizabethan style); Lamellen, Tremeer and Wetherham Lamellen has a garden with some very large rhododendrons and cryptomerias. Between 1941 and 1962 the garden became very overgrown but after 1962 a programme of reclamation began. The garden is full of interesting plants such as Stewartia pseudocamellia, Magnolia campbellii and Rhododendron malayanum. Another notable garden is the garden of Tremeer which is full of rhododendrons and camellias. There are fifty Kurumes[clarification needed] sent to Cornwall from Yokohama and planted in the lawn by Major General Harrison. Behind the house is a plantation of camellia varieties. Harrison has produced several varieties of rhododendron from Rhododendron impeditum and R. augustinii; these were given local names 'St Tudy', 'St Breward', 'St Merryn' and 'St Minver'. The paths through the rhododendrons lead to a pond at the far end of the garden. Other notable plants in the garden are a Camellia 'Donation' and a Magnolia x veitchii. One of the most well-known of Thomas Rowlandson's paintings is "Hengar House the seat of Matthw Mitchell [sic] Esqr., Cornwall" (1812) which was sold at the Sir Richard Onslow sale, Sotheby's, 15 July 1959. Hengar was a country seat of the Onslows. Edward Byllynge was a colonial administrator and governor of West New Jersey from 1680 to 1687, until his death in England. Byllynge owned a large section of land in New Jersey with the Quakers. He was born at Hengar. The parish church is dedicated to St Tudius and was restored in 1873. There was a Norman church here but the present structure is of the Perpendicular period. There are two aisles, the arcades of which are identical. The tower has three stages, is 64 feet high, and is topped with battlements and pinnacles; there are six bells.<A sixth bell was added in 1923 see church guide book>  It is Grade I listed. Anthony Nicholl (died 1658) is commemorated by a sumptuous memorial erected by his wife. In the churchyard is a pre-Norman coped stone with carving, possibly a rare hogback tomb. Trevenning Cross is at a road junction about one and a half miles northeast of the churchtown. It was found in the hedge[when?] close to its present position by J. R. Collins of Bodmin. The bell-ringers of the village are celebrated in the song The Ringers of Egloshayle (Roud 1163). Notable people from St Tudy include: William Bligh, naval officer; Eddie George, former governor of the Bank of England; Oscar Kempthorne, statistician and geneticist at Iowa State University; Richard Lower, early experimenter in blood transfusion; Humphrey Nicholls, MP for Bodmin; and Vice Admiral Sir Louis Le Bailly who led a campaign for the local pub to be renamed after William Bligh. Major-General Eric Harrison served in both world wars; he was a rugby player, Olympic athlete, and later a painter; in retirement he lived at Tremeer. ^ "Civil Parish population 2011". Neighbourhood Statistics. Office for National Statistics. Retrieved 17 March 2017. ^ "Owen's New Book of Fairs: Published by the King's Authority. Being a ... : William Owen : Free Download & Streaming : Internet Archive". archive.org. 2014. Retrieved 2 August 2014. ^ Synge, Patrick (1977). The Gardens of Britain; Vol. 1: Devon and Cornwall. London: B. T. Batsford. pp. 120–23. ^ "Sir William and Lady Onslow". The Cornishman (66). 16 October 1879. p. 6. ^ "St Tudy". Genuki.org.uk. 2012-03-25. Retrieved 2015-06-26. ^ Historic England. "Details from image database (67804)". Images of England. Retrieved 28 March 2010. ^ "myADS" (PDF). Archaeology Data Service. Retrieved 2015-10-23. ^ "An Old Cornish Song, The Egloshayle Ringers". ^ "The Egloshayle Ringers - Changeringing Wiki". wiki.changeringing.co.uk. Retrieved 29 July 2018. ^ "Vice-Admiral Sir Louis Le Bailly - Telegraph". The Daily Telegraph. London: TMG. ISSN 0307-1235. OCLC 49632006. Retrieved 4 December 2014.